I would recommend something more mainstream to new comers as such a change is very hard to make... Try Linux Mint or Ubuntu as they are easier because there are tons of info and solution to possible problems you may encounter, and they are often better with drivers and software repositories. Drivers and one of my major concerns. And I suspect that all my past attempts with Linux failed because it didn't have the correct drivers. But that would mean that one needs to buy only standard hardware with the hope that standard drivers can work with it. That probably rules out many laptops and most GPUs. And specialised devices that only come with Windows drivers would be unusable. And I suspect that all my past attempts with Linux failed because it didn't have the correct drivers. What types of hardware did you have problems? And specialised devices that only come with Windows drivers would be unusable. Linux have a big list of compatible hardware... Most of the problems are with very specific hardware that is often controlled by Windows software, and some are not very complete and lacks some functionality. Laptops. Overheating, keyboard misconfigured, USB ports dead, low display resolution, not charging. I assume the chipsets are being misidentified or something but I didn't have time to try and figure it out so I gave up. But it appears the list is not yet large enough. I don't blame Linux for this though. It is the manufacturers that are responsible for such things. And many manufacturers keep their designs secret and only provide Windows drivers, leaving everyone else to play the reversing game, or just simply give up due to lack of time or boredom. Would the ZaReason X345 be a terrible purchase? I read about the Ubuntu spyware which is a worry. Apparently it can be easily removed with a magic command line incantation. But just the fact that Canonical is prepared to do such a thing doesn't make me feel good about it. What is to stop them adding more spyware in a future update? 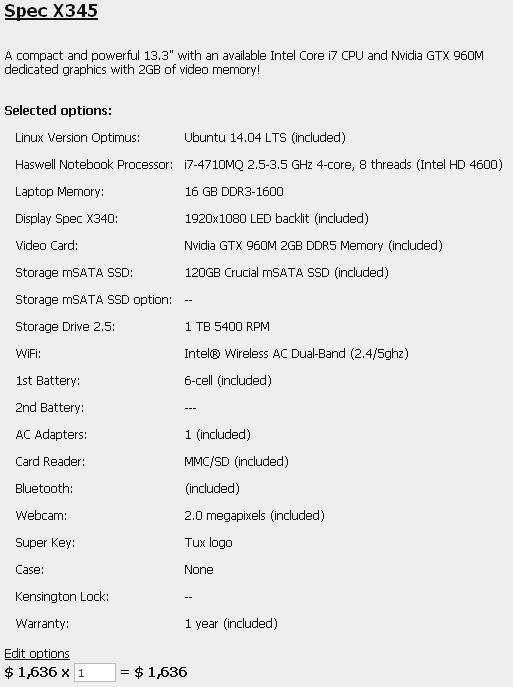 Looks like an awesome laptop, and probably instead of Ubuntu* you could easily install another Linux distro. It is 2kg which is kind of heavy for me to carry everywhere. But the 1920x1080 13.3" display is good. I like highly detailed screens where I can display lots of information all at once in a small space. The batteries are changeable which is good. The Tux logo is too bright and distracting, I would take that off. And the camera will get a permanent sticker cover, or I might disconnect it completely. The same for the microphone. Being a Linux noob I would probably just stay with the default OS (after disabling the spyware) until I can build confidence that I won't completely brick things by trying to install something else. The SSD doesn't interest me, they are not secure enough for my purposes. I could remove that and give it to my colleague perhaps. But still the biggest problem is compatibility with all the current software we use. I still need to figure out if that can be done. you could get to experience both world. If you still need some Windows specific programs, for example, VM is the way to go. *** is VM? Can you be more specific please. Some people don't know what to do when they are disappointed with a new Windows. The only right thing to do when you are disappointed is to stick with the windows you prefer. Microsoft's goal is to listen to the audience and what they want, so if you don't want a particular version of windows, don't use it and microsoft will know that you don't like the new windows, simply by when you update windows, they will know what version you prefer, they have it statistically. You're not being left behind simply by choosing the windows you prefer, you are actually telling Microsoft to produce a different windows when you refuse to use one. At least, according to their own words, they "listen" and "they listened to the users" is often repeated. If you don't like a windows, don't use it, it's automatically recorded when you use windows update. The real danger is facebook and all of that hype, many windows users are facebook users and all of microsoft's windows is starting to look like one giant facebook already, it's a danger to the future because they are many as you probably know already. Can you believe that when I was buying ham the other day (to have on my sandwich) there was a facebook logo on that ham in the store. I couldn't believe my eyes, it's everywhere. There seems to be little that we can do to oppose facebook and nothing can be done to NOT see facebook for a few minutes a day, it's on all web pages that one visits, there is a facebook logo, in windows and in other programs they have some facebook in it, it's on the food packaging, on milk bottles and on coffee mugs. I have nothing against facebook, but I'm tired of the "religion" that facebook constitutes, it's not facebook I'm tired of, it's the religion of it, it has consumed the society in its entirety. Sticking with what you prefer only goes so far. Many people fall for the propaganda of "it is old and therefore it must be useless" and "no updates means it will be virus ridden and dangerous". Also, there is no upgrade path for new technologies (e.g. drivers for display port, USB3, etc.). Plus the awful sense of not being part of the newest trendy stuff is like social suicide. I still use WinXP as my main system when I am not travelling. So I have already committed social suicide in the eyes of many around me. But when I look for new hardware a lot of it won't run correctly in XP for various reasons. There will come a time then my main machine dies and I will have no option to stick with what I prefer. I have to follow a path forward at some point. About the social suicide, if you don't speak their language, there is no language. They only understand one language, it's the hyper modern language of what is currently in store, or is most up to date. They buy it, if you don't have it, you can't have a conversation with them, it's that simple and brutal. Some people have a tremendous ability to follow up on the trend, even when they grow older, perhaps it's an extraordinary capacity to adapt, and they are truelly "blessed". If you talk to a random person out there about assembly, none have probably not even heard of it. I saw a HLL programmer speak about that he discovered that assembly existed and he tried it for a couple of days, he hadn't even heard of assembly before. And now that mobile devices are in people's bags, in the billion numbers, there is no such thing as one computer anymore stationed at one particular place in the house, people run software on their bicycles, on the mountain and when fishing, on all kinds of devices. We're living in very different days. Being "stuck" with assembly isn't about not being able to adapt, it's more about identity I think. Taring down your identity, just to build up another one is not an easy task. But this does not apply to assembly coders only, it happens to people who code C also, some of them swear to C and refuse to use C++ or C#, they suffer the same "problems", it goes up the hierarchy. There is one big problem I see with the asm community, a few questions that seems unanswerable to most of them. "Is the goal to stay in the current timeframe or is it to move forward? What things will you do to move forward, or what things will you do to remain in the current timeframe? Does assembly allow evolution, what drives it forward? Is the goal to adapt to the demands of the consumer or is assembly just artwork to you, if it is just artwork, who will be the consumer of that artwork". A different question, is the goal to make the old and outdated fit better in a world that has no intentions of staying behind? What is the current speed an assembly artist is moving forward, in terms of adapting to the ever-moving-forward world, if you would express it in kmh or mph. Is the gap expanding, retracting or is it the same. assembly is artistry at its most beautiful, but it's not sustainable, moving from gorgeous artwork to "beautiful artwork" isn't easy to do. Ask any painter if he would like to make his painting a little bit more uglier for the sake of adapting to the world, he would go crazy. I think I will give Windows 10 a miss. Windows 10 is a state-of-the-art operating system with innovative features, improved security, and a fresh look. I think Microsoft's strategy here is surprisingly well thought out. Their execs finally figured out "to know your enemy you must become your enemy". Windows 10 is free [free like the beer, not like the bear, for a whole year], has a new state of the art graphics API (DirectX v12) created by the best graphics specialists, real software engineers, and real testers in the business, awesome developer tools (Visual Studio) that actually work with real CPU/GPU debugging and profiling support all built in, all of your existing apps and games still work, and they're pulling out all the stops with the Halo/Xbox branding right down into the OS and browser. Then why they don't stop "stealing" ideas from the open source community? Most "innovations" were already existent years ago, but only now they had the courage to copy and paste them. LOL! And about DirectX 12: It is far, very far from being the best graphics API available. From developer to end user point of view. DirectX only succeeded because of dirty practices. But times have changed and soon it will be a thing of the past. Its model is obsolete. DirectX only succeeded because or dirty practices. But times have changed and soon it will be a thing of the past. Its model is obsolete. This is your opinion, which I find disagreeable. I like MS and I think that they are the best in their field, if they aren't innovative then who the f*** is?! What graphics API do you consider the best? If you have in mind OpenGL, OpenGL used indeed to be the best graphics API, but DirectX is currently far and ahead of OpenGL, and has been for some years now. Regardless of how much MS cares about it (or how much they seem to care about it), they currently have the best graphics API available. The reasons why DirectX is "bad" compared to what you can do on consoles have nothing to do with MS or their ability or desire to make a good API, but rather the simple realities involved with targeting a wide range of graphics hardware, there's no legitimate, practical alternative for a DirectX-like API on PC. Even John Carmack acknowledged that DirectX API is "probably the best graphics API as far as a sensibly designed thing that I've worked with". Right now I don't care if it is the most amazingly innovative, efficient and beautiful OS that could ever be imagined, because the spying and logging make it untenable. I'd much rather pay for an OS and not have it track, log and try to monetise everything I do. Beauty is only skin deep. Look inside to see the real monster.